We have so many things that we begin to “expect” from others when we come onto staff at a church initially or over time we begin to see the warts and bumps of others and begin to change our view of them. We can have good expectations for those we work beside when we work with other families on staff. While these pointers may not be exactly what you would think first hand, I believe there is some wisdom from these expectations we can have of each other and pray that you can learn to apply them so that you can have peace within yourself of others and have peace in your church. Have a great day, my friends! 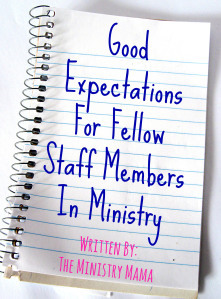 This post is addressed to staff members, not necessarily the pastor and his wife, but people who serve alongside a pastor with other staff families to help you know how to have good expectations with those you work with. There is always transition of getting to know the people already working at the church or those that come into a position after you do. It takes time to know who they are and their personalities. Many people are disappointed with the personalities of their peers immediately while other people have a honeymoon of loving who they work with UNTIL (key scary dramatic music here) personality conflicts arise.